Sometimes when we are in an intuitive state, something will grab our attention to add to the information we seek. This happened to me on August 14th, 2014 while I was doing my morning work. Part of which includes pulling today’s Tarot Meditation card and divining a message. On that day I typed a line “Why do you insist on focusing on the worst case scenario“, the digital photo album that sits next to my pc popped up the picture of the crow shown below and he grabbed my attention. Letting me know there’s more to this statement than we may realize. If you’ve been following along with us over the past few months, you know that Crow Magik has been working fairly hard lately in our little part of the world. So much so that you can’t help but notice their presence. Crows and their cousin the Raven are the messengers of change and transition. But that’s not always bad. Often times transition brings good things that we need and maybe even things we’ve been asking for. Even though we as humans often have a hard time with change, it’s the only constant in the Universe. It cannot be avoided. Crows and Ravens bring us this message and remind us we are moving and our actions dictate the direction of that movement. They let us know things are in transition and now is the time to be Mindful of our thoughts, communications and actions. What we think, say or do will impact the direction of our movement and if we move forward with positive action, or fall backward and repeat old negative patterns. They signal that change is occurring and only we can create the direction of that change, forward. Often times, transition is a hard change. It may mean that for change to be completed, some things have to be closed and said goodbye to. That could be relationships that aren’t good for you. Places you no longer need to be in. Thinking that no longer serves you well. Or actions/activities that are in the way of moving forward. Even a combination of these things could be present. But all these good byes are also bringing forth many hellos as well. You may look at people, places or situations differently. What you weren’t interested in before could become intriguing from this moment forward. This change could bring excitement and interest where before there was none. They could be exactly what you’ve asked for, but weren’t ready to see or be open too. Modern science that has studied the Crow place its intelligence on the same level as that of a six year old. Proving the old myths that Crow is the smartest of birds to be true. What’s more, they know they’re smart and enjoy exercising their intelligence. They are constantly putting their knowledge and experience to the test in order to outwit other animals, including we humans. Ravens understand cause and effect, while crows often use tools that they make themselves. They are also very playful and mischievous and can be trained to mimic calls or perform tricks when kept as pets. There are five species of crows, one of which is the raven. The term “crow” refers to members of the Corvus genus, known as corvids, and includes crows, ravens, rooks and jackdaws. The only real difference between each variation is their size and slight variations of shape and size of their beaks. Those with a totem of Crow or one of its cousins should study all five of its family line. The crow group includes species such as the American crow, fish crow and northwestern crow. The American crow is one of the most recognized crow species. 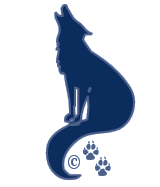 They live in several parts of the United States, primarily in residential areas. American crows generally nest in evergreen trees and forage for insects, seeds, mice, nuts and carrion at sites such as landfills, farmlands, parks and backyards. They have short, square tails, straight beaks and are entirely black. 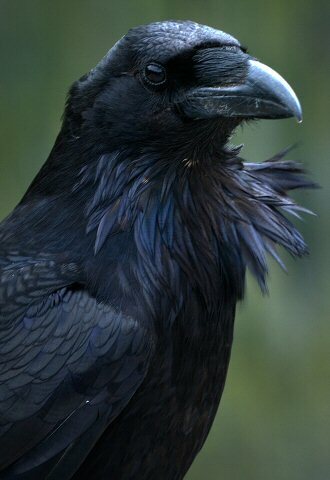 Common ravens are the most widely distributed raven species. Ravens are also completely black in color, although they are bigger than crows and have puffy feathers around their throat and a thicker beak. Ravens live throughout the northern hemisphere in several different habitats, including mountains, forests, beaches and grasslands. They tend to be solitary or live in pairs, unlike the more social American crows. Ravens eat insects, fish, eggs, baby tortoises and garbage. Jackdaws are highly social birds found in parts of Europe, northern Africa and western Asia. Unlike crows and ravens, jackdaws have light eyes and gray feathers on their head, neck and chest. The rest of their bodies are covered with black feathers. They are also smaller and have shorter beaks. Jackdaws inhabit woodlands, pastures and parks, feeding on seeds, insects, snails, spiders and garbage. Rooks live in parts of northern and central Europe, as well as Asia. Although they are mostly black, they differ from crows, ravens and jackdaws in that they have pale, grayish skin around their beaks. Their leg feathers also have a more ruffled appearance than other crow species. Rooks are found in open fields and the outskirts of residential areas, where they feed on worms, insects, grains, small birds and carrion. Rooks are very social and travel in large flocks that sometimes include jackdaws. Crows live in large, close-knit families, and, like social mammals, they not only hunt and forage together but also defend territories and care for the young together. Most species, however, do not nest in colonies. Each mating pair has its own nest of sticks and twigs, usually high up in a tree. There are laid five or six greenish-to-olive eggs, with darker speckles. Young crows may spend up to six years with their parents before breeding on their own. I’ve mentioned before my favorite resource for Animal sign are the books by Ted Andrews; especially Animal Speak and Animal Wise. I’m constantly going to these two books for information about the animals that cross my path. the cycle of power: All Day and All Year. There are many stories and legends about their black color and how it came to be. One of my favorite is a Native American tale about the original crow who was pure white. One day the God of storms became angry when the people of the land cursed his presence and yelled at him to leave and allow the Sun to shine. He covered the world in darkness and soon the world fell into cold and it began to snow. All the animals and humans fell silent and shivered in the frigid world as the flakes fell on and on. When they pleaded with the Storm to move on and let warmth return to the land, the Storm God brought forth a blizzard and drove them all back into hiding. The animals went to Crow and asked her what they should do? Crow said we must talk to the Sun who can force the Storm to leave. The animals asked Crow if she would talk to the Sun, after all she can fly higher than all other birds. Crow reluctantly agreed. Because Crow was white as the snow, she can hide amidst the falling snow and the Storm God would never see her make the journey. And so it was that Crow flew higher and higher until she was through the clouds and basked in the warmth of the Sun. But Sun could not hear Crow as she was too far away. Crow had to fly even higher and closer than she expected. Up and up she went until she was burned and singed by Grandfather Sun. She delivered the message and asked for help. Of course I will help said the Sun. You return to your kindred and let them know I am coming. Crow quickly dove for home and flew through the Storm clouds as quickly as she could. But her beautiful feathers were no longer pure white, but burned and black as coal. She worried that the Storm God would see her and strike her down before she returned. As Crow flew out of the clouds her fears were laid to rest, as it was night in the land and still the Storm could not see her. Crow returned to the shelter where all animals had taken refuge and delivered the message from Grandfather Sun. But she was sad and cried when her mission was complete. I have lost my beautiful white feathers, she cried. The Wise Ole Owl came forth and said do not cry my friend. For everyone will look at your glistening black feathers and remember the sacrifice you made to save the world. You will be honored and revered for all the days to come. Grandfather Sun kept his promise and forced the Storm God to fade and blow away. His warm rays cover the snow and melted it away. It wasn’t long before the trees extended their fingers and the leaves provided shade. The forests and gardens burst forth with color and once again all was right in the world. So it was that Crow became the messenger of the land, and shares the breath of love and creation through her beautiful black feathers. Many cultures see black as the color of birth. It’s a symbol of nothingness, the dark womb that creates and brings forth the light of life. Keep in mind that in ancient times, most people viewed time through a lunar calendar. Each new day began at night fall. The darkness was the beginning of things and it burst into light as the Sun rose. This perspective of Crow being the messenger and bringing about change is also universal. Even in Alchemy the Crow’s black feathers were viewed as the symbol of creation. As Christianity began to grow in Europe, the Crow was associated with black magik, witches and the devil. Much like the black cat, these two became symbols of dread, evil and fear. The “transition” message wasn’t one of change, but of death as they totally ignore the concept that Crow can create. Where as the Raven is associated with the transition of death or foretells the outcome of battles, both big and small. 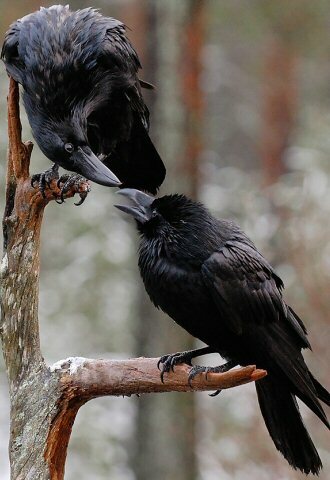 Crows and Ravens are great communicators as well. Another message that’s shared in the Native American story. They are constantly talking and keeping in touch with their family members. Sharing information about food, danger, and general happenings within their territory. That voice they share comes from the song bird family and they can make beautiful music. Especially in times of courtship. Male crows will preen for hours, making themselves as handsome as possible. When they find a female they want to mate with, the male crow will begin a very beautiful song. If you’ve ever had the pleasure of hearing it, you would probably think it was some other type of song bird and not a Crow. Like many animals they can predict the change in weather. Keeping a watchful eye out for their movements and characteristics can help you see how the winds of change are moving through your own life. Their connection to creation can also connect them to the changes of transition through all phases of life, including past lives. 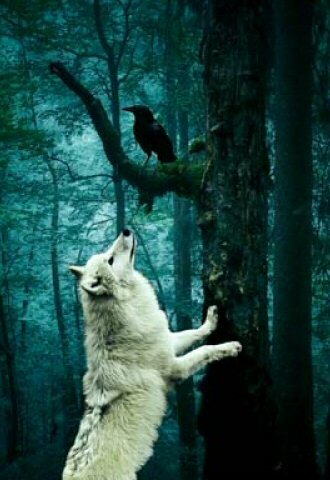 In many cultures, such as Greek, Roman, China, Athapaskan Indians of Alaska, the Celts and the Norse all have legends of the Crow being part of the creation of the universe. Wherever crows are, there is magic. They are symbols of creation and spiritual strength. They remind us to look for opportunities to create and manifest the magic of life. They are messengers calling to us about the creation and magic that is alive in our world every day and available to us. Be patient; for Magik is afoot!